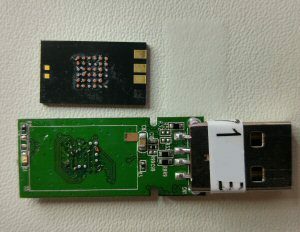 In this case we have a conventional Alcor AU6998SN based USB flash drive with a Toshiba monolith (THNU3EN00PL07) re-purposed as the NAND. 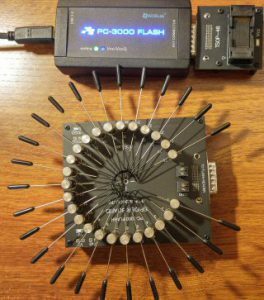 With our PC-3000 Flash tool and the Spiderboard adapter from Ace Laboratories we can read the data from the NAND. You never know what you will find when you open a conventional flash drive package so you need professional data recovery hardware, software, adapters and experience to recover the user’s data. When we received this case the connector was still attached, but the monolith had been ripped from the PCB. It’s obviously a poor design and something has to give when the device is dropped, banged, or bent. If you have a damaged USB flash drive we have the tools and experience to recover 95% of the data recovery cases we receive. With unmatched pricing, free return media, and a “no data, no charge” guarantee there is no reason to hesitate. Send in your flash drive now!